Capturing another player's capital will destroy their kingdom and they will become your follower. Your followers can still conquer villages and other players capitals, but their conquests will count towards your Prestige , making it easier for you to gain more valuable titles. Your followers' generals are highlighted in green on the map. On the other hand, your followers are required to pay you 20% of their Trade after each turn. These taxes are not immediately added to your resources, they accumulate and can then be collected using the Followers tab on your Home page. The taxes are not transferable or collectable if your follower's capital is not connected to yours. If one of your followers is isolated, you will not be able to tax them. Defence : You can leave some of your troops to help defend your followers. Your troops will help to stop revolts and defend against enemy attacks. Revolt : Your followers can revolt if they still have troops stationed at their capital and you haven't left any troops to defend it. A master automatically has right of passage and the authority to collect resources in his follower's kingdom. 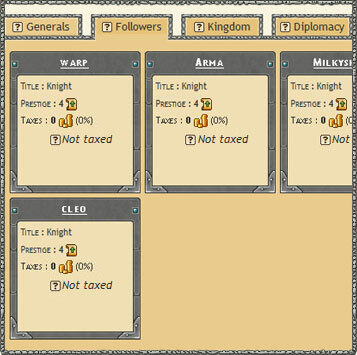 In return, followers can move freely throughout their master's kingdom (see the Diplomacy section).